After hundreds of years of war, humanity has begun to rebuild. Now the remaining pockets of civilization remain confined behind gigantic walls, safe from the beasts- human and non- that stalk the earth. The outlying badlands, thousands of miles of untamed wilderness overtaking the remains of the old world, are as dangerous and corrupt a place as could be imagined. Still, there’s a living to be made out there for those with the constitution, the fortitude, the propensity for violence needed to survive. The Rumble Kings are just those kinds of people. Raleigh and his band of merry misfits hunt the creatures most live behind gigantic walls to avoid, collecting bounties and looking after their own. When word reaches them that a former associate and friend is in trouble, the Kings charge into the thick of it without a second thought. Being used to leaping without looking, the band has no idea just how far into it they’re diving until after they’ve landed. Now they’re standing in front of an army led by forces determined to raise an ancient evil and rule over humanity’s remnants. For better or worse, it’s time to get to work. Rumble Kings is a tough one to categorize. With elements of science fiction and fantasy woven together, I half expected to see Thundarr, Ariel, and Ookla to go riding across the page. That never happened, but the slightly different spin on the post-apocalyptic setting was just distinctive enough to stand out. 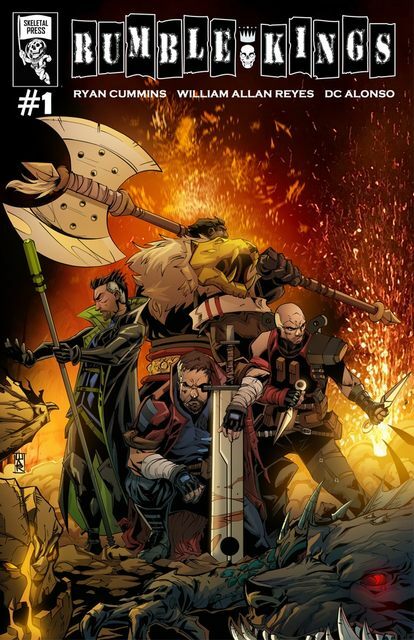 Also, the tone of the book had hints of Skullkickers and Rat Queens, personal favorites of mine, which went a long ways toward smoothing over any of the rough spots and growing pains involved in a brand new independent title looking to break out after a successful Kickstarter campaign. Ryan Cummins has put together a tongue in cheek-heavy story of misfits and ne’er-do-wells coming together to battle the forces of Evil (when it’s got a capital “ E”, it’s pronounced Eeee-vyl), whether they like it or not. While the plot hasn’t really shown much by way of complexity so far (it’s just the first issue), he’s introduced an entertaining cast of characters to compensate. Where some indie books by newer writers may struggle with the flow of dialogue, Cummins actually has that pretty well in hand. His characters sound more natural, making good with the banter and wit in the midst of the action and mayhem… of which there is plenty. 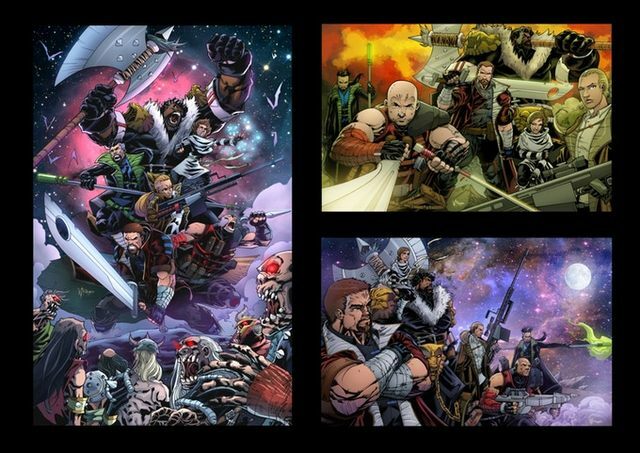 At times, it was easy to lose track of the sci fi elements of Rumble Kings, with the presence of gigantic trolls and warriors swinging improbably large swords and axes. And then the scene would shift to one of the walled cities- with its graceful spires, flying cars, and requisite armored Stormtrooper dudes carrying blaster rifles- and I’d be right back onboard. 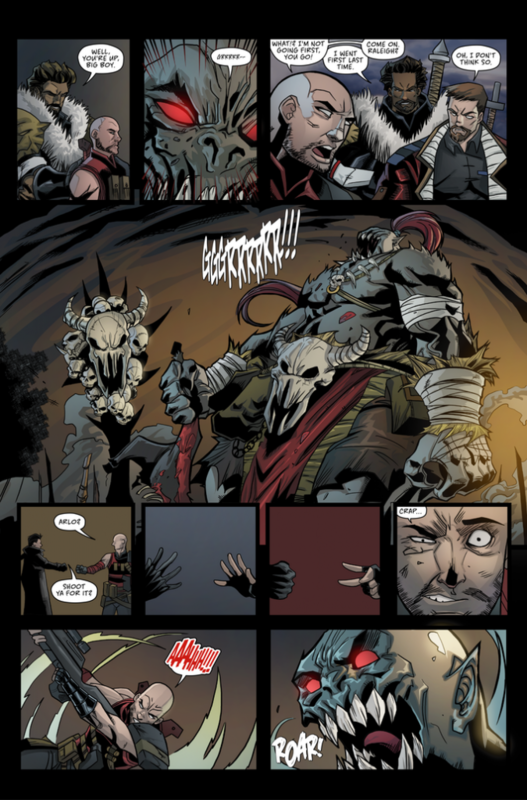 Artist William Allan Reyes did a pretty solid job of showing the two very different environments making up the world of Rumble Kings. 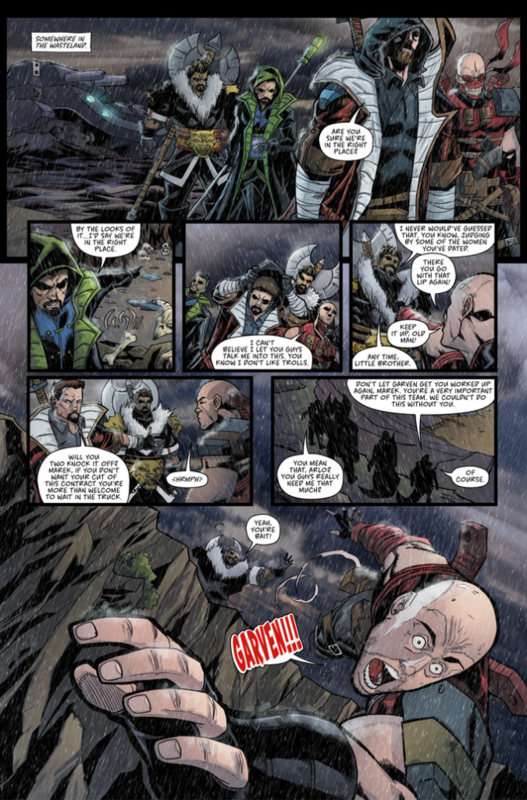 He also seems to have a gift for portraying the action… not a small thing given the kind of title this is… and uses different panel layouts to show perspective and size (giant troll, remember?). I might’ve liked to see some bigger effects to give a little emphasis to the big guns being used (Raleigh’s hand-cannon should produce something more dramatic than a relatively understated flash and a “blam”), but that’s pretty minor and could very well just be a “me” thing. 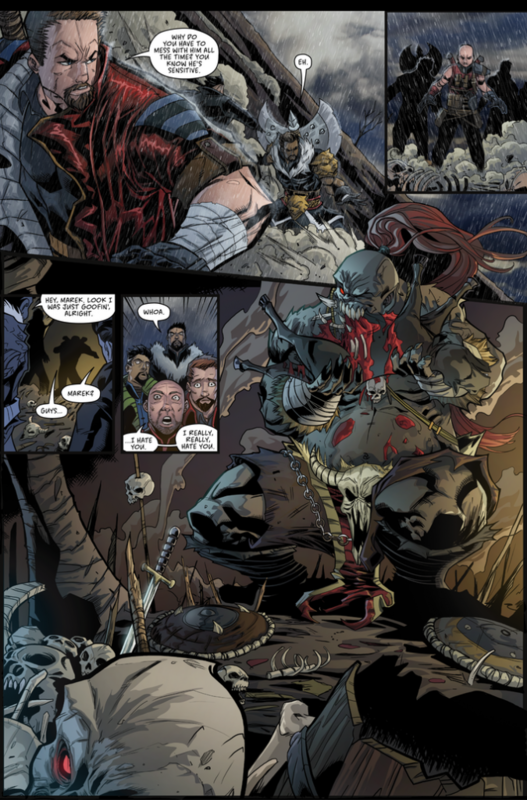 Finishing off the visual appeal of Rumble Kings, DC Alonso’s colors give the title a classic comicbook look, differentiating characters by color scheme and highlighting the action by shading the backgrounds to emphasize focal points. Alonso also does his part to differentiate the grim and gritty Outlands from the straight lines of the city, keeping the bastion of civilization bright and shiny by comparison. Finally, the lettering of Toben Racicot does its job, presenting the dialogue without too much distraction… again, though, I have to mention some of the understated sound effects shown, and wonder if the battles could have been given a little more punch with some creative sound effects. Anyone out there who likes their action titles fast and furious could do a helluva lot worse than Rumble Kings. Its opening issue presents two very different worlds co-existing on the page, in a story that’s looking like it could devolve into a no-holds barred throw down at the drop of a hat. The characters are entertaining, and interesting enough to make me want to see what else the creative team can accomplish. I give Rumble Kings 7.5 out of 10 decapitated trolls… but they’re pretty big trolls, so the curve is pretty liberal. It’s a good thing.